Doutzen Kroes’s Baby Boy, Phyllon Joy Is One Year Old! I can’t believe how time flies! It’s like days ago I was all emotional seeing pictures of Doutzen Kroes, pregnant, at her wedding! 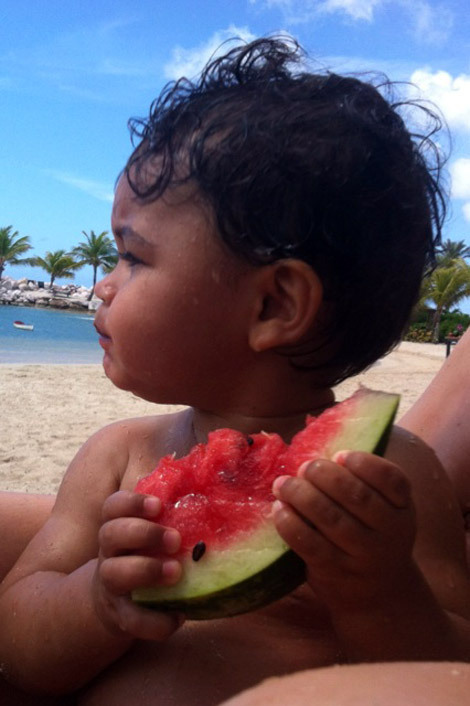 And now, here’s Doutzen’s her baby boy, Phyllon Joy, all grown up, having his first birthday healthy cake! Happy Birthday sweetie! Isn’t he adorable? So very adorable. Last week in the supermarket I did something I never do: I’d grab a gossip magazine with the whole family on the cover. Inside filled with such cute photos of them three: what a pretty family they are. I believe the photographer had permission. That was obvious when I noticed his name.